Google has announced Google Shopper – a new mobile app which allows shoppers to look for bargains in a number of different ways. The app gives you the option to search through voice, text, barcode or even images. So, you can take an image of a Blu-ray, ask the app to search for deals on a book or just 'scan' a barcode and see what prices the cloud comes up with. The app is currently in the Lab stages, so it's not a fully fledged product but it could well be a killer application for Android and its app store, which is still lagging quite a bit behind Apple's. 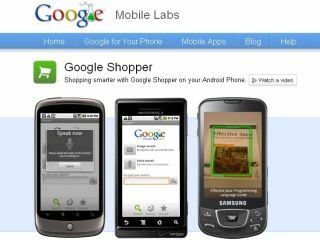 Then again, there's no word that Google Shopper is to stay exclusively to the Android platform. Once you have searched for your item, the app will give you product photos, descriptions of the product, reviews and specs. There's also an offline mode which will let you view products that you have already had a look at. The application seems to have implemented some of the visual tech Google last used in its Goggles application. If you want to try out the app, point your browser to GoogleLabs.com now.